Olga Horvat, MA, is the founder of Royal Dogs Gallery, a company that provides spiritual and holistic products and services exclusively for dogs and their owners. She is also a Paranormal Pet Expert and a certified Lumia Science Color Therapist who clears behavior and health problems in pets by utilizing unconventional methods such as colored light, crystals, elixirs and essential oils. 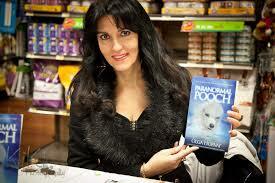 Olga is the author of the wonderful book, “Paranormal Pooch: A True Story of The Dog who Healed One Family”. What are the four ways to identify whether your pet has a soul. Why would people deny the existence of soul in animals? Can animals come back after death? Can a spirit take possession of an animal? What are the five warning signs your pet may be possessed? What are negative energies and the secrets to avoiding harmful energies in your home? How can negative energy be eliminated from people and animals, if accidentally affected? ABOUT ANIMAL COMMUNICATION: Learning animal communication is an exciting journey into the Self, the nature and reality of our world, a behind-the-scenes look at the many complex interconnections between us all, and the real truth about relationships. It’s also about discovering how to connect at deeper levels with other beings. My hope is that this course proves very useful to you in many ways. Learning to master animal communication takes a lifetime of study, practice and education. But don’t be scared! Any animal lover can learn how to talk with animals, if they’re willing to put the time and effort into learning how. You can too! Ready to learn how to talk to animals yourself? Check out all of my courses at Learnhowtotalktoanimals.com, Start Here! Take a look and choose what most appeals to you. If you are a newbie, then I highly recommend starting with theBeginning Core Foundations Course. The Advanced Animal Talk Mastery Course is awesome and includes many of my favorite, most powerful healing techniques along with many specific topics that every animal talk student needs to know how to deal with successfully. If you’re already registered, then keep an eye on your inbox for the next announcement.